Purple Pyjama Party 2018 is coming on 26th March. My Family, Our Needs and Epilepsy Society have put together some information to help you raise awareness of epilepsy and host your own event. 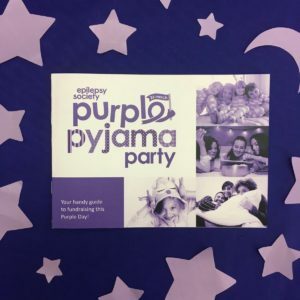 This Purple Day, the Epilepsy Society is asking as many of you as possible to host a Purple Pyjama Party! Think cosy pyjamas, midnight snacks and plenty of fun and games. If a pyjama party isn’t for you, there are lots of other ideas on how you can fundraise this Purple Day. We have lots of inspiration for you this year to help you make your fundraising event even more fun and even more purple! The free fundraising guide includes lots of ideas on hosting your purple event, and comes with Epilepsy Society balloons. Purple Day Selfie Props – strike a pose for Epilepsy Society with our downloadable DIY selfie sticks. ​Counting Sheepstake – place your baa-ts on our sweet sheep to raise money to support people affected by epilepsy. Purple Quiz – a hit in the office, our purple quiz will put your knowledge to the test! Epilepsy Society has even created two essential posters for promoting your event; the What, When, Where poster is great to raise awareness of your event, whilst our What is Purple Day poster is essential reading for guests new to Purple Day. What’s a purple party without some purple food and drink? Epilepsy Society has picked some of its favourite recipes to share with you, including Purple Punch and Beetroot Brownies! They’re sure to please your guests and raise some extra money at your event. Wear purple with pride this March 26th with Purple Day merchandise and accessories. From Purple Day Pin Badges to adult and kids t-shirts, wigs, keyrings and Gus the Gnome, merchandise is a great way to donate to vital research work this Purple Day and make your event even more purple! And if that’s not enough for you, why not create some purple prizes for the winners? The Spa in a Jar is a pampering treat that any Pyjama Party goer is sure to love! If games aren’t for you, our nourishing DIY purple facemask will add some pampering indulgence to your event. To speak to someone about Purple Day please contact the fundraising team at fundraising@epilepsysociety.org.uk or call 01494 601 414.